Amherst, MA – Sara’s Wish Foundation (SWF) and the University Massachusetts Transportation Center (UMTC) are proud to announce they have received a Safe System Innovation Grant from the Road to Zero Coalition to advance the SWF and UMTC collaborative effort to end traffic fatalities by 2050. To qualify for a Safe System Innovation Grant, an organization must clearly explain how its program will improve safety on the roadways, set a timeframe for the reduction in deaths and injuries, outline how the program will be evaluated, and detail how the organization intends to reach its target audience, among other elements. The SWF and UMTC program will include: “before” seatbelt usage counts along motor coach routes in selected locations in the United States; the development of a comprehensive plan to educate motor coach passengers about the benefits of wearing seatbelts and to persuade passengers to wear their seatbelts (where installed); implementation and evaluation of the comprehensive plan with the aid of “after” seatbelt usage counts; post-implementation focus groups; and the final preparation and distribution of the campaign “kit.” It should be noted that SWF and UMTC have a long history of working with U.S. DOT agencies including Federal Motor Carriers Safety Administration, National Highway Traffic Safety Administration, and the Federal Highway and Transit Administrations as well as the American Bus Association, United Motor Coach Association, Greyhound, Peter Pan Bus Lines, and other motor coach industry stakeholders. The work of Sara’s Wish Foundation focuses on the promotion of safe travel both nationally and internationally as well as the support for humanitarian work across the globe. The year 2018 has proved to be a particularly remarkable one for us, and we are excited to share these accomplishments with you. The feedback we receive from so many people re-affirms our resolve to invest our resources in these important activities, thanks to the support of Sara’s Wish friends like you. Also, last year we reported that Sara’s Wish partnered with the UMass/Amherst Center on Transportation to host a “Safety Summit” in Washington (October 2017) in order to build a campaign to persuade motorcoach riders to “Buckle Up” while traveling on a bus where seatbelts are available. A low estimate of 15% of passengers use safety restraints, yet annually 21 bus passengers perish and almost 8000 are injured. A Task Force has been assembled to guide this motivational campaign. With the cooperation of Peter Pan Bus Lines, Sara’s Wish and the UMass Transportation Center are conducting a pilot test to market buckling up. Researchers are riding bus routes to determine our benchmark of the percentage of passengers wearing seatbelts. Then, in 2019, passengers will be exposed to marketing items – banners, video on bus, labels on bus seats, and the like – to urge clicking their seatbelts. A logo and slogan “Be Safe…Sit, Click and Ride,” have been designed. Passengers will see this message multiple times as they begin their motorcoach ride. Measures of seatbelt usage will be taken to gauge success. The goal is to develop tool kits for bus operators to use in urging their passengers to wear their seatbelts. We can save lives and prevent injuries by increasing seatbelt usage on motorcoaches! For over twenty years now, Sara’s Wish Foundation has been able to help more than 175 remarkable women gain what they have often told us were “life-changing” experiences working across the globe on humanitarian service projects. These projects are transformative for everyone involved, including those of us at Sara’s Wish! As you may recall, this award is intended to provide substantial financial support for the on-going humanitarian work of previous scholarship recipients. Award candidates must be engaged in well-established initiatives in the global community and demonstrate a sustained commitment to travel and personal safety. Our 2018 awardee, Maria Hetman, is making the commitment of her time and talents to make a substantial difference in the lives of others and for the good of us all. See Maria’s headline news story below. **To read “all the news that’s fit to print” from Sara’s Wish Foundation in 2018 CLICK HERE. Sara’s Wish Foundation Announces the Recipient of the 2018 Global Humanitarian Award! Maria Hetman first received funding from SWF in 2009, a scholarship that made it possible for her to accept an unpaid internship monitoring war crimes trials for an investigative journalism outlet in Sarajevo. After that, Maria was awarded a fellowship to study in Budapest, after which Maria returned to Bosnia to work for various non-profit organizations. Maria is now pursuing a second masters’ degree in environmental protection and agricultural food production at the University of Hohenheim in Stuttgart, Germany. 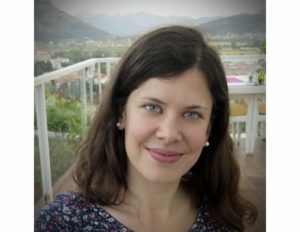 This program includes field work and applied research, and, not surprisingly, Maria is pursuing her field work in the Balkan region. Over the years, Maria has demonstrated remarkable dedication, integrity, and tenacity. For these reasons, Sara’s Wish Foundation gave Maria an award of $5,000 to help defray the costs of tuition and field study. 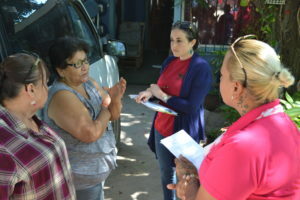 In addition, upon receipt of evidence of her successful studies during this academic year and in anticipation of continued significant financial need in the second year when she will be engaged in more extensive and intensive field work, we are prepared to offer Maria an additional award of $5,000 in 2019. Sara’s Wish Foundation Announces the Recipients of the 2017 Global Humanitarian Awards! Our 2017 awardees are making the commitment of their time and talents to make a substantial difference in the lives of others and for the good of us all. Three amazing young women have been named the Global Humanitarian Awardees for 2016. All three demonstrate a deep and sustained commitment to projects that have direct and immediate impact on the lives of many in our global community. SWF scholarship recipients Genevieve Smith (2013) and Kali Basman (2014) are two leaders of Visionaria Peru, a collaborative initiative that partners with local NGOs to offer leadership institutes for disadvantaged adolescent girls as well as economic projects of their design in the girls’ home communities.. SWF awarded Genevieve and Kali $10,000 to cover costs of both the Leadership Institutes and the Activism Projects. Watch Karla Mendoza’s video to learn about Refresh Bolivia! Karla Mendoza received her first scholarship award as a freshman at Harvard College in 2014 for a health service project in Bolivia. This past summer, with funding $3500 from SWF, Karla returned to Bolivia. Her funding was used by the Refresh Bolivia organization to promote “ecosocial” growth related to health and sanitation in rural communities. The focus of Refresh Bolivia is on building rural/urban partnerships and capacity training in order to improve living conditions through self-sustained initiatives. Projet Jeune Staff & Newly Trained Leaders Celebrate! Global Humanitarian Award Recipient Nahid Bhadelia Honored by The Fletcher School at Tufts University! [February 2016] Nahid Bhadelia, who holds three degrees from Tufts, including a MALD from The Fletcher School, has made the study of and the fight against dangerous pathogens her life’s work. This work has propelled her to a job as an infectious disease physician at Boston Medical Center and to prominence as director of infection control at Boston University’s National Emerging Infectious Diseases Laboratory. 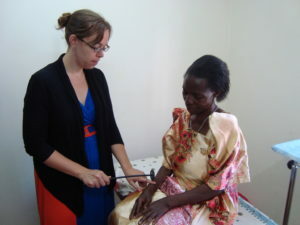 Now she is adding further to her life’s work: advocating for and supporting the local health care workers who were so instrumental in helping to contain the outbreak last year and will be instrumental in future epidemics. For this, and for being at the vanguard of the critical international effort to build better responses to disease outbreaks, Bhadelia has been named the winner of the third annual Fletcher Women’s Leadership Award. January 18, 2015: Sara’s Wish Foundation is delighted to announce that the first recipient of our new award in support of a substantive humanitarian initiative somewhere in the global community. 1999 scholarship recipient Nahid Bhadelia’s proposal was to institute a training program [Infection Control Training for Ebola Survivors – Training the Trainers Curriculum] for up to 80 persons in Sierra Leone on how to appropriately and safely work with Ebola “survivors,” both those who have had the disease and those who have been left orphaned or, in some other way, destitute due to the spread of this infection. The trainings will involve understanding the true nature of Ebola, information on infection transmission and disease control, and critical specifics such as how to put on the personal protective equipment. This training program will create trainers out of those in the workshop and so the web of information and prevention of infection of treatment personnel will expand. We granted Nahid $10,000 for her program, with the funds channeled through the non-profit organization Partners in Health (with which Nahid is affiliated). 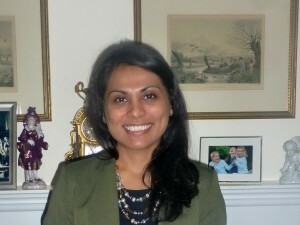 Sara’s Wish Scholarship Recipient Nahid Bhadelia Takes Lead in Ebola Mission! In 1999, Nahid Bhadelia received a $2000 scholarship from Sara’s Wish Foundation, a grant which supported her travel to India where she worked to increase AIDS awareness. Nahid had just graduated from Tufts University when SWF gave her this scholarship; SWF could see in this young woman the kind of courage, competence, and determination needed to make a difference in our global society. Today, Nahid is one of three American physicians who has traveled to Sierra Leone, under the auspices of the World Health Organization. While this mission is chiefly humanitarian, it is directly related to Nahid’s role in Boston where she is the Infection Control Director for Boston University’s National Emerging Infectious Diseases Laboratories. Maia, our second New SWF Award recipient, has distinguished herself as a humanitarian and educator in ways that are extraordinary for one so young. A 2013 graduate of Haverford College, Maia received her first scholarship from SWF that year in support of her establishment of a leadership, service, and mentorship program for young adolescents in a school district in Madagascar. 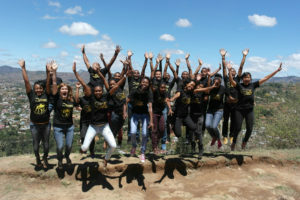 That initiative, “Project Jeune Leader,” has become so successful in the past two years that it is expanding to multiple locations in Madagascar and has secured major funding from the Principality of Monaco. However, bridge funding was needed, and Maia received a $6,000 award from SWF. With its high quality design and responsible impact analysis, we are confident that Project Jeune Leader can serve as a model for educating adolescents about health, safety, and personal responsibility across the global community. Check out Maia’s video, a wonderful way to learn more about the work of “Project Jeune Leader” in Madagascar, and to hear Maia’s statement of appreciation to Sara’s Wish Foundation. Project Jeune Leader staff and newly trained mentors celebrate! New!!!! Global Humanitarian Award Opportunity Available to Past SWF Recipients! Since 1998, we have provided financial support for a total of 175 young women! These young humanitarians have made a difference in 65 countries across every continent (except Antarctica, of course)!! As a result of generous donor support, Sara’s Wish Foundation has given a total of $243,750 in scholarships!!! Beginning in the Fall of 2014, ALL 175 recipients of Sara’s Wish Foundation‘s scholarships are now invited to apply for additional funding in support of their humanitarian work across the global community. Note: We are no longer offering funding support to new candidates. Only those women who have received financial support from SWF in the past are eligible for this award. For more information, contact us at info@saraswish.org.New!!!! Global Humanitarian Award Opportunity Available to Past SWF Recipients! Beginning in the Fall of 2014, ALL 175 recipients of Sara’s Wish Foundation’s scholarships are now invited to apply for additional funding in support of their humanitarian work across the global community. Note: We are no longer offering funding support to new candidates. Only those women who have received financial support from SWF in the past are eligible for this award. For more information, contact us at info@saraswish.org. After a number of years of debate, in December, 2013 the U.S. Senate and House of Representatives passed the Motorcoach Enhanced Safety Act [MESA] which mandates beginning in 2016 all U.S. motorcoaches must have seats with three-point safety restraints. 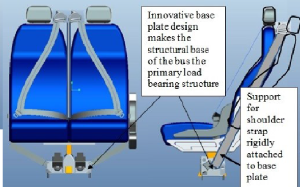 However, the 30,000 existing buses on the road today were not mandated to be retrofitted because of the estimated cost of such a retrofit…$40,000 to $80,000 per 54-seat bus. Such an expenditure would compel a large portion of the 3500 independent motorcoach companies to go out of business. Sara’s Wish Foundation and the University of Massachusetts College of Engineering have been developing over the past decade a patented portable seatbelt. And the understanding of this portable invention allowed the engineers to adapt the design to a lower cost, now provisionally patented, retrofit design that would reduce costs of a retrofit to less than $10,000. Anne and Charlie Schewe along with their College of Engineering partners in the design, Professors Sundar Krishnamurty and John Collura, have been working in Washington to gain the support of key constituencies. All organizations and agencies have voiced strong support for this Sara’s Wish Foundation initiative. While governmental and industry organizations supported no retrofit in the MESA bill, they strongly preferred to have a motorcoach retrofit but were compelled to oppose so as not to drive many bus companies out of business. SWF and its partners have the backing of the American Bus Association and its president, Peter Pantuso, has attended numerous governmental meetings with SWF to show support. The retrofit team has met with the National Highway Transportation Safety Administration, the National Safety Transportation Agency, and expects to meet with the Secretary of Transportation, Anthony Foxx, himself to voice SWF’s concern for the retrofit and the solution that it has. We are getting traction for our efforts in this retrofit initiative…and as always, hope to save lives in Sara’s name. That, we believe, is Sara’s wish! The University of Massachusetts’ College of Engineering through the assistance of Professor John Collura recently has received an award of $50,000 from the State of Massachusetts Department of Transportation that will allow completion of the final aspects of the retrofit design as well as the crash testing of the design. 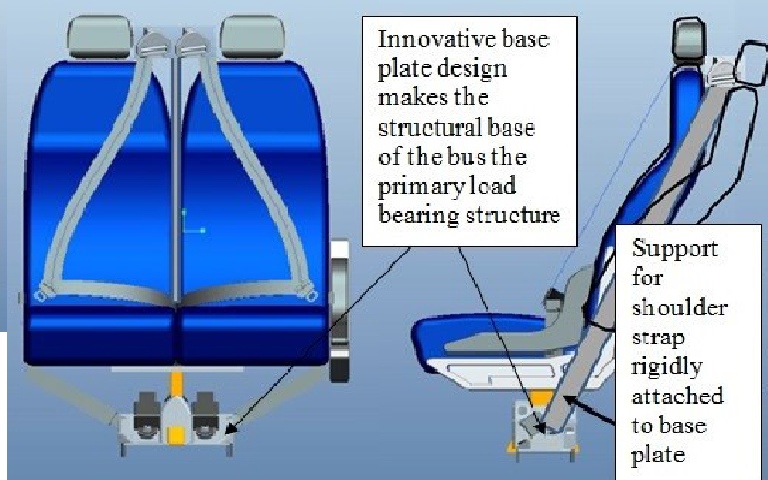 American Seating Corporation, the largest motorcoach seating manufacturer, has graciously provided a bus seat for testing. So this retrofit initiative is in fully “on the road” during 2015. 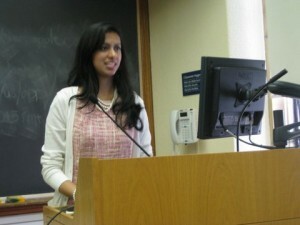 Trisha Pasricha talks about her documentary at the conference at Yale University. Follow this link to read about the tragic story of the death of Casey Shulman. Sara’s parents were contacted by USA Today and Anne was quoted . Thought you’d like to see this article. Note that they point to Sara’s death in 1996 as the turning point to improving safety in study abroad. Mary Jo A. Pham is a second-year student pursuing a M.A. in International Communication, with a concentration in Public Diplomacy and Social Change. Her research interests include statecraft, gastrodiplomacy, popular communication, and social change. 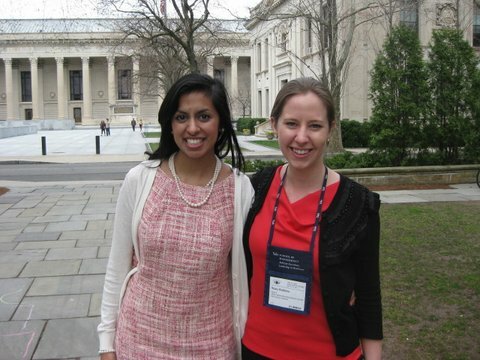 Mary Jo graduated from Tufts University in 2011 with a B.A. in international relations and a minor in Chinese. Prior to beginning her studies at the School of International Service, Mary Jo volunteered, worked, and studied abroad in Vietnam, Cambodia, and China. She has over 7 years of experience in print, online, and radio journalism and has published over 150 news articles through her work as a contributor for Fortune, NPR New England, and The Republican newspaper in her hometown of Springfield, Massachusetts. Most recently, Mary Jo published “Food as Communication: A Case Study of South Korea’s Gastrodiplomacy” in the 2013 Spring volume of the Journal of International Service. 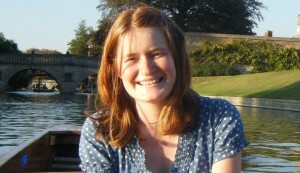 Mary Jo received a SWF scholarship in 2009, funds which enabled her to work in Cambodia in a foreign service internship. She is a 2010 recipient of the Thomas R. Pickering Undergraduate Foreign Affairs Fellowship and will join the U.S. Foreign Service as a public diplomacy-coned officer following her graduation in May 2013.